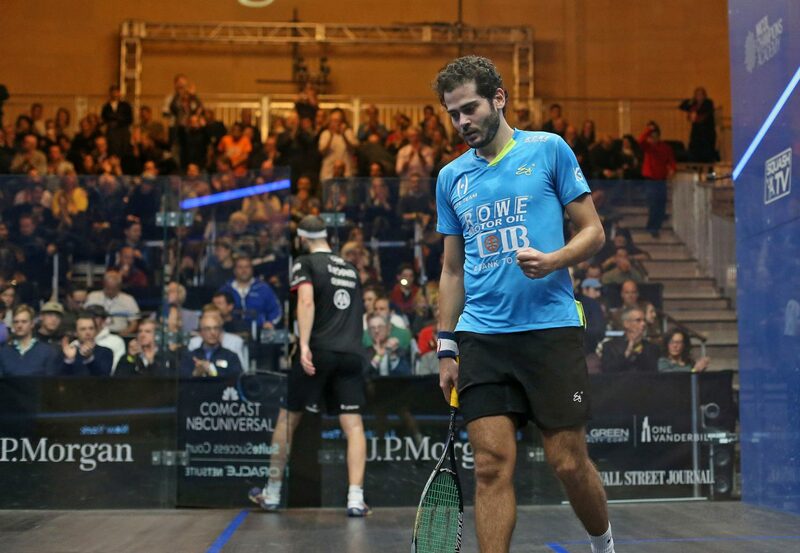 World No.5 Karim Abdel Gawad ended the title defence of Germany’s Simon Rösner after a commanding performance from the Egyptian saw him move into the semi-finals of the PSA Platinum event held at New York’s iconic Grand Central Terminal. Gawad, the 2016 ToC champion, almost fell to an ignominious exit in round two after falling two games behind against World No.23 Joel Makin, but an ankle injury sustained by the Welshman in game three handed Gawad a lifeline as he progressed into the last 16. But, following wins over compatriot Fares Dessouky and now Rösner, Gawad looks to have shaken off his slow start to the tournament and the former World No.1 dominated his opponent to end Rösner’s defence of the coveted trophy. Gawad is a renowned slow starter but he dominated right from the beginning and maintained that control throughout the match to save some energy for what could be an epic semi-final against fellow Egyptian and top seed Mohamed ElShorbagy, who won a massive match against dangerous Peruvian Diego Elias. “Simon beat me the last two times last season, and he is now the World No.3,” Gawad said after his victory. “He has improved a lot, and he was always top 10 but now he is even better than he used to be. He is the defending champion here so it was a very tough match, of course. “I had to be very strong mentally in order to win against someone like Simon, especially a 3-0 win. I had to focus 100% today. The day’s other men’s quarter-final saw World No.1 Mohamed ElShorbagy prevail in a thrilling five-game battle with Peruvian Diego Elias to avenge his defeat against the World No.11 in November’s Qatar Classic. In what was arguably the match of the tournament so far, 22-year-old Elias twice took a one-game lead, but was pegged back both times by a resurgent ElShorbagy. Elias fell just short in the deciding fifth game as fatigue took its toll, with the scoreline finishing 9-11, 11-9, 9-11, 11-8, 11-5 in the Egyptian’s favour. ElShorbagy and Gawad will meet in a repeat of the Black Ball Open quarter-finals, with Gawad prevailing en route to winning the tournament. “This kid [Elias] is going to beat us all one day,” ElShorbagy said afterwards. The women’s third round took place yesterday and saw both of the remaining US players exit the tournament as World No.11 Amanda Sobhy and World No.19 Olivia Blatchford Clyne suffered respective defeats against Egyptian duo Nour El Tayeb and Nour El Sherbini. An out-of-sorts El Tayeb went a game behind twice against Sobhy, the US No.1, and fell to an 11-1 defeat in game three. However, the World No.3 was able to weather the storm in the fourth to level the scores, before holding her nerve to convert the decider. 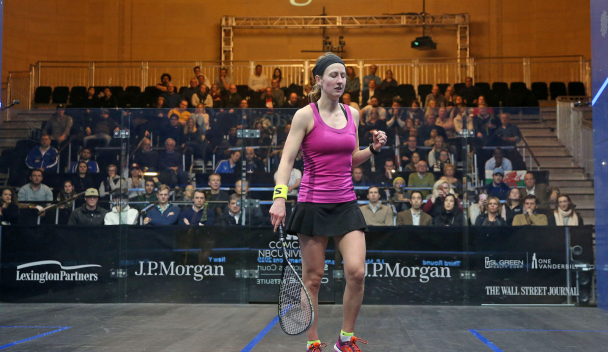 Meanwhile, Blatchford Clyne fell victim to a masterclass from defending champion Nour El Sherbini, with the World No.2 overpowering her opponent to win 11-5, 11-5, 11-3 in 23 minutes. El Sherbini will play fellow Egyptian Salma Hany for a place in the semi-finals after the World No.16 upset two-time runner-up Laura Massaro to win in straight games. The 22-year-old Hany will now compete in the last eight of a PSA Platinum event for the first time. World No.1 Raneem El Welily got the better of India’s Joshna Chinappa and she will play World No.8 Nouran Gohar next in a repeat of their five-game clash in the semi-finals of the Hong Kong Open. Meanwhile, New Zealand’s Joelle King claimed just her second career victory over Malaysian legend Nicol David at the 12th attempt to set up a quarter-final fixture with 2017 champion Camille Serme, who overpowered England’s Victoria Lust . The day’s final third round match was an all-British battle as England’s World No.9 Alison Waters defeated Welsh World No.10 Tesni Evans by a 3-2 scoreline in a see-saw encounter lasting 71 minutes. The last match of day six was a gruelling 71-minute encounter, which saw Alison Waters overcome Tesni Evans at Grand Central. Evans loves nothing more than beating the top English girls but Waters had a score to settle after losing to the Rhyl Rocket in the final of the National Championships last year. The first three games were tight throughout, but Evans won the third to take her first lead in the match. Waters bounced back to come from behind and level the game in the fourth, with a comfortable 11-6 victory. The fifth looked like it could have gone either way but, as Evans started to cramp up, Waters was able to take charge and win it 11-8, 8-11, 9-11, 11-6, 11-5. Waters, who will face Nour El Tayeb in the quarter finals, thanked spectators for staying until the end. She said: “Yeah it was a tough one. It was point for point and it felt like that really. “It felt like I was trying to get away and I couldn’t, and then Tesni was trying to get away and she couldn’t. It was just one of those matches where it felt like a game of chess really. “I felt strong in the fifth. I probably didn’t look like it at times but I think Tesni was struggling more than I was. Really delighted, and thanks everyone for staying because it is a late one, I know. “I felt like I was moving well but I felt like I rushed it a bit at times. Obviously, it was a good chance for both of us to get to the quarters. The last two men’s quarter-finals – and the entirety of the women’s last eight fixtures – will be played tomorrow (Tuesday January 22). All of the action from Grand Central Terminal will be broadcast live on SQUASHTV (rest of world) and Eurosport Player (Europe only) and play starts at 13:30 (GMT-5). 2019 J.P. Morgan Tournament of Champions, Grand Central Terminal, New York, USA.